Blogging and email marketing go hand in hand. It’s the most effective way to turn the casual visitors who scroll through your website into leads who may potentially become customers at some point down the line. Convincing your readers to leave your website to follow you on Facebook or Twitter isn’t easy, and email marketing allows you to create a more relaxed, personal and intimate environment for you and your readers to communicate through than social media does. We’ll get into why every blog needs an email list in a second. Just know that you need one as well, even if you haven’t published your first post, yet. However, there are a lot of options to choose from, and one thing you may have noticed is how outside of your budget some of them are. That’s the focus of this post. We’re going to go over why email marketing is important no matter what size your blog is as well as a few reasons why you may want to get started for free. We’ll then go over a few solutions you can use to do just that. We hinted at a few ways blogging and email marketing go hand in hand at the beginning of this article, but we barely touched base on the subject. Making money blogging relies on three things—a content marketing strategy, quality content and an email list. Think back to why you’re blogging in the first place. For most marketers, it’s to increase product or affiliate sales. Blogging is simply one pillar in content marketing that helps you drive traffic to your website where casual visitors can be converted into customers. The path for this outcome comes in many forms. The path where a visitor views your landing page and immediately purchases your product or clicks on your affiliate link is thin and nearly untouched. Instead, choose a path that allows you to encourage these visitors to subscribe to an email list. With an email list, you can continue providing value to visitors (who are now subscribers) in the form of free content before asking them to buy. This allows you to establish trust by being honest and truly beneficial to the problems they’re having rather than having to rely on skeevy marketing techniques that will only lead to you being labelled a “spammer.” It also allows you to build a list of people who are most likely to purchase your products even if you don’t have any to sell, yet. Lastly, it can help you turn casual readers into “raving fans” by providing a way for them to come back when you release new content or promote older content. We can go on and on about the benefits of email marketing, but let’s switch gears and talk about why getting started for free may be more beneficial for you. Why Start an Email List for Free? So, you get the idea that you need an email list by now, even if your blog is just a pipe dream at this point in time. There are plenty of options for you to choose from, most notably services like ConvertKit, Aweber and Campaign Monitor. However, these services have pricing models that may not be suited for new bloggers, especially if your budget is small. That’s one reason why you might want to start an email list for free. Another reason is commitment. Most of you will be blogging in your free time in between working at your 9-to-5, spending time with friends and family, and taking care of all of the other responsibilities in your life. If this is the case, you may find it hard to justify paying $20/month or higher for a service you don’t have much time to use. Lastly, recalling the “plenty of options” bit, you may find it difficult making a monetary commitment to a product you know very little about, especially as a new blogger. With that said, let’s go over five different services that allow you to start an email list for free as well as a few tips on how to choose between them. Let’s talk about a few things to consider before you decide on an email marketing service provider to use. Your service provider stores your email list for you, and you’ll need to transfer and import that list to your new service provider if you ever want to move. Because of that, it’s important to consider your options, specific needs and individual situation before deciding on a provider. Let’s talk about your needs. You may know very little about email marketing right now, but consider what being subscribed to your list would be like for your subscribers. What I mean, consider which features you feel you’ll need. Many marketers preach about the benefits of using plain-text emails over stylized ones, but what if you’d prefer to send “prettier” emails to your readers? Make sure you choose a service provider that offers HTML templates or even some sort of visual builder. When it comes to your “situation,” make sure you choose an email marketing service provider that scales with your business harmoniously. All of the options listed below are not free forever. You will need to upgrade to a paid plan at some point. If you don’t plan on making much time for your blog and therefore aren’t likely to grow as quickly as you could, you’re better off choosing a service provider that allots a generous amount of subscribers and emails sent per month. There are two essential features every marketer needs from their email marketing service provider. They are automation and segmentation. Automation, or marketing automations to be more specific, puts your email list on auto pilot. It allows you to work hard building email forms and writing multiple autoresponder series. Segmentation allows you to segment your audience into two or more groups you can use to send targeted emails and promotional content to each individual segment. This improves open rates, click-through rates and ultimately conversions. Hopefully, you have a better understanding of what it is you should be looking for in an email marketing service provider, which means it’s time to jump into our list of services that allow you to start an email list for free. 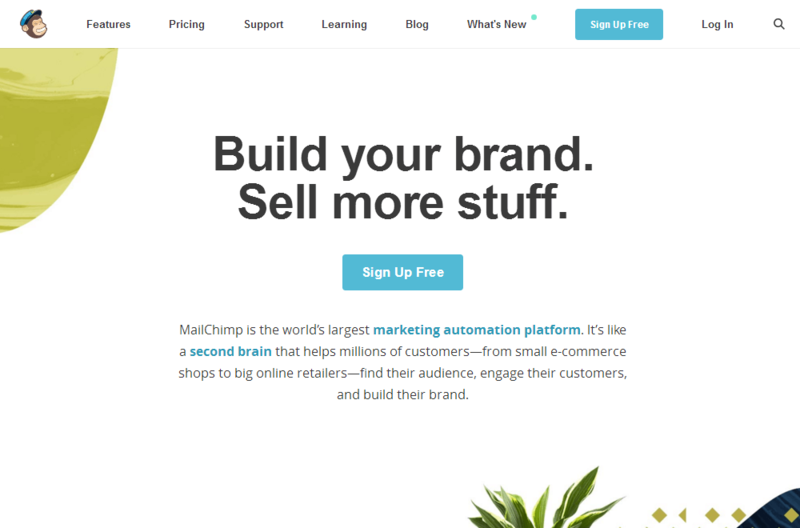 MailChimp is one of the biggest email marketing service providers in existence with millions of customers around the world. It offers nearly every feature your email list could ever need whether you’re a small-time blogger or a big-time ecommerce business. A few features include powerful marketing automations that allow you to welcome new subscribers as well as segmentation that allows you to build multiple sub-lists within your main list based on purchase activity, demographics and more. 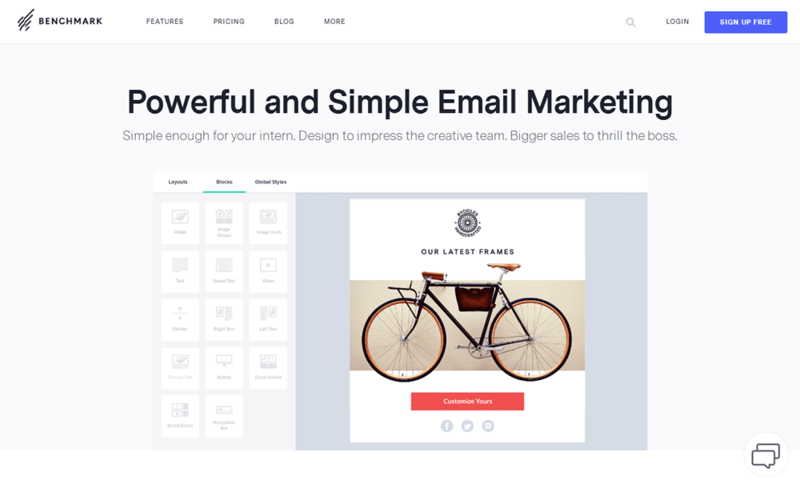 This service also provides the ability to build beautiful, well-designed emails. You can use pre-made templates and add your own content to it or use MailChimp’s drag-and-drop builder to come up with your own design. Lastly, it offers powerful analytics and reports that can help you make smart, strategic decisions when it comes to your email list. New marketers can start with MailChimp’s “Free Forever” plan. This plan allows you to build a list of up to 2,000 subscribers and send 12,000 emails per month before you’ll be required to upgrade. Paid plans start at $10/month. 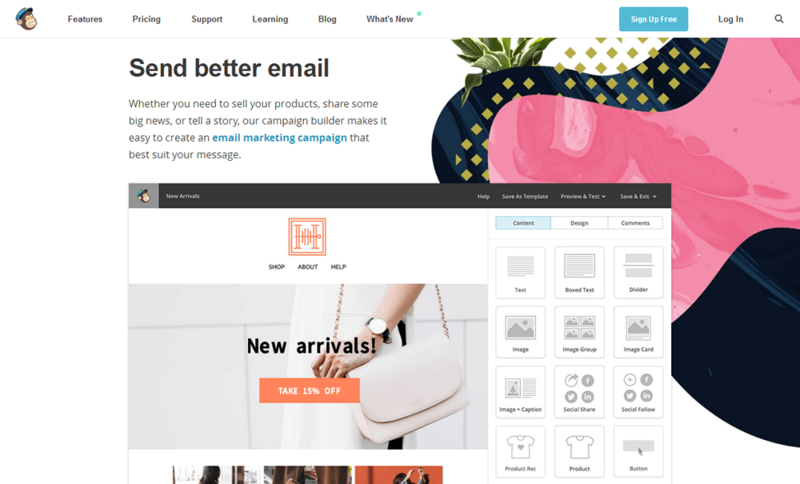 MailerLite is a smaller but just as powerful email marketing service provider that continues to grow its customer base alongside the list of features it offers. The first feature we’ll go over is automations. A specific automation you can use in multiple ways is the autoresponder series. Use this to welcome a new subscriber with special emails, promote a product launch or even send a series of specialized emails when a subscriber clicks a specific link. MailerLite also offers things like segmentation, A/B testing, email forms, landing pages and reports. Something that will likely attract beginners is the clean, incredibly easy to use user interface this service offers. It’s clean, incredibly straightforward and guides you through the process of building forms, emails, automations and segmentations. 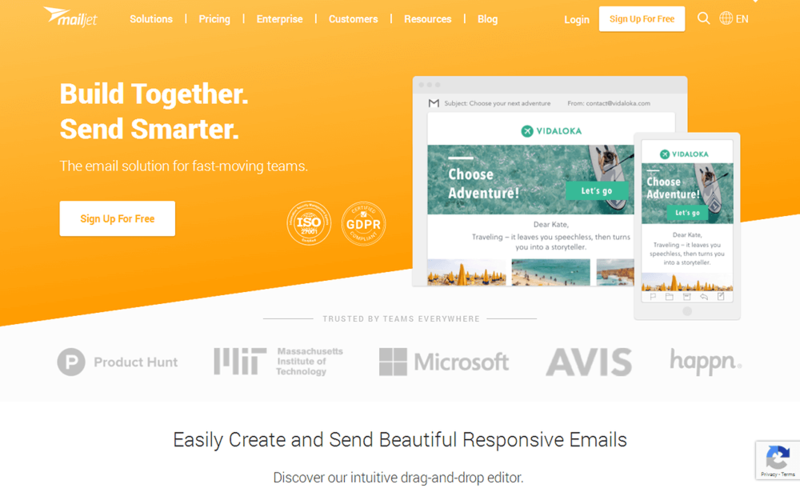 Speaking of emails, this service also offers a drag-and-drop editor that’s just as easy to use as well as email templates that save you time. MailerLite’s free plan allows you to have up to 1,000 subscribers and send an unlimited number of emails every month. Paid plans start at $10/month. MailChimp and Aweber get a lot of press, but Mailjet is actually one of the most popular, most powerful and simplest services out there. It’s also incredibly affordable, even for beginners. It offers much of the same features the previous two services offer but offers them in different ways. When it comes to automations, it allows you to set up a few triggers or “conditions” in which the service will begin sending pre-written emails in an autoresponder series when that trigger is activated. 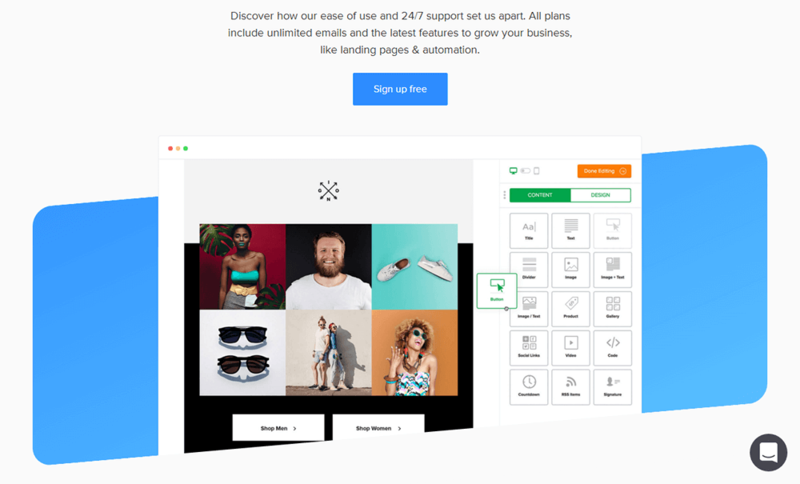 You’ll also enjoy another drag-and-drop visual builder you can use to create and customize your own emails as well as templates that streamline this process. This service also has email segmentation, A/B testing, reports and even a few advanced features. This service is free for up to 6,000 subscribers, at which point you’ll need to start paying $9.65/month. 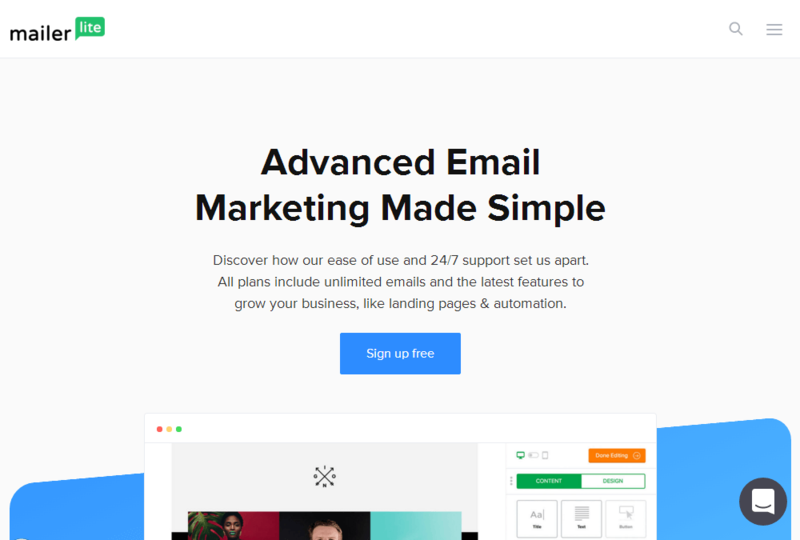 Benchmark is another popular email marketing service provider that doesn’t get much attention but is still widely used and jam-packed full of features. It features much of the same marketing automations we’ve seen in the previous services, such as the ability to send specific autoresponder series to specific subscribers based on an action they took on your website or in an email. Speaking of which, segmentation is another feature this service offers, and it integrates with automations. One example is the ability to move subscribers from a Leads list to a Customers list after they’ve completed a purchase. As far as forms go, this service allows you to create typical yet well-designed email forms, but it also offers something unique in the form of polls and surveys. When it comes to the design of your emails, you can use templates or a built-in drag-and-drop editor. The free plan comes with limited features and allows you to send as many as 14,000 emails per month to a list of up to 2,000 subscribers. Paid plans start at $13.99/month. SendPulse is a bit of a unique marketing software. It offers much of the same features you’ll find in the previous services, such as automations, ready-made templates and a drag-and-drop editor, but it offers much more than that. With SendPulse, you can connect with your readers through push notifications, SMS messages and even phone calls. 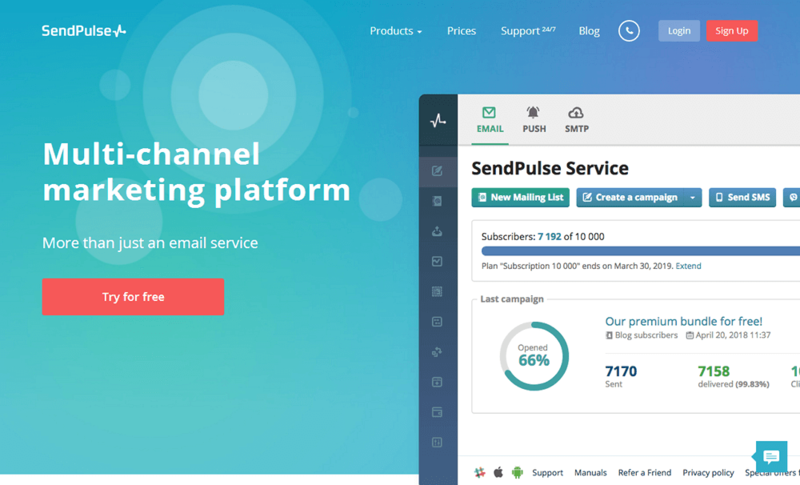 As far as email marketing goes, SendPulse is free for 15,000 emails per month and as many as 2,500 subscribers. Paid plans start at $9.85/month. When you’re new to blogging and only doing it less than part time, it can be difficult to keep up with a regular publishing schedule let alone an email list. Hopefully, this list gave you plenty of ways to get started without making too much of a commitment. One thing you may have noticed is how similar each of these services is to one another despite the differences they have in UI design. I recommend reading through/watching reviews on each one to gain a better understanding of how they work. With that said, they’re all fantastic options, so if you’re pressed for time, choose one with paid plans that align with your budget and growth potential. MailChimp, Benchmark and SendPulse are great, but you may be severely limited by the restrictions on the number of emails you’re allowed to send per month, for example. Once you’re set up with a service, be sure to read through our guide on how to create an email marketing strategy to continue on your journey.